To be in time for the monsoon padi and to defy the indignation of the world, the Myanmar government is probably conducting one of the last great displays of socialized shock labor mobilization that we might witness in our lifetimes. China Hand reports. The 5 per cent of Myanmar's population affected by cyclone Nargis accounts for roughly 15 per cent of the rice produced in the country. For that 15 per cent to get harvested, all the seed has to be in the ground by July 30 to catch the summer monsoon. It has to get the cyclone victims out of the relief camps and back into their villages, hope they can scrape together the bare necessities of shelter and food to sustain a working life, get them the wherewithal to plow and seed their fields, and make sure they finish up the planting in eight weeks from today - and 12 weeks after the worst natural disaster in the country's history. The alternative - letting the survivors recover their shattered lives and health in relief camps under the watchful eye of international humanitarian organizations at the expense of the monsoon padi - is, for the junta, almost inconceivable. 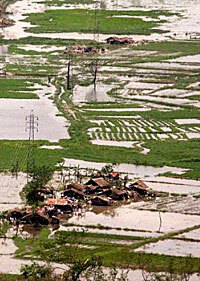 Missing the monsoon padi means Myanmar's rice production collapses. Instead of exporting hundreds of thousands of tons of rice, it would have to import hundreds of millions of dollars worth of rice to avert food shortages in the rest of the country. Missing the monsoon padi means relying on the kindness of strangers and the generosity of the international community to make it through a 15-month food crisis. Relief workers have a window of only a few weeks until the end of June to help farmers in the delta start planting rice if they are to avoid missing the crucial monsoon season, Diderik de Vleeschauwera, spokesman for the UN's Food and Agriculture Organization, said yesterday, according to the UN's IRIN news agency. The Myanmar government is already emptying disaster relief camps of not particularly happy or healthy survivors and putting them to work on compulsory labor projects to rebuild the delta's infrastructure and prepare for the monsoon padi. "Reliant on food aid beyond the emergency relief phase" is probably not a place the Myanmar government would like to be. Given the rather meager haul of pledged aid at the donors' conference in Yangon on May 25, the junta undoubtedly believes the West would be happy to expend the relative pittance needed to succor cyclone victims in their camps - while hoping that the need to import food will force dangerous concessions to Western demands for supervision of the aid process and political dialogue with the democratic opposition or, at the very least, drain the purported and purportedly massive illicit financial reserves of the regime. Given this situation, it is not surprising that the Myanmar regime curtly denounced "chocolate-bar relief" from the international community in the wake of the disappointing donors' conference and advised its weary citizens that there was no alternative to bootstrap self-reliance. If the exhausted farmers of the delta are able to get the planting in under the watchful eye of the brutal Myanmar military and an at least partial harvest is gathered in the fall, Myanmar will be able to negotiate the international terms of engagement from a position of relative strength - and defy the inchoate indignation of the world. Click here: For feedback and comments.